I didn’t see Schindler’s List in 1993, when it first in theaters. I saw it in 2018 for the first time and I’m glad I waited. As a Program Associate at Facing History, I have had a similar journey in learning about the Holocaust as a Facing History student would have. I have learned about issues of identity, we/they, conformity and consent, as well as the actual history in ways that have made me appreciate the film so much more than I would have 25 years ago. 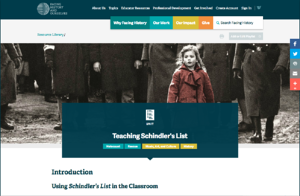 In December, 2018, Facing History released a revised Teaching Schindler’s List, an online teaching guide to the film to coincide with the re-release of the film in theaters to commemorate its 25th anniversary. As part of our work in promoting the film and our teaching guide, Facing History, in collaboration with AFT/SML and the National Council for Social Studies, offered a webinar, in November 2018 that featured Steven Spielberg. In the webinar, Spielberg spoke about why the movie is relevant for students today. He said that hatred, violence, anti-Semitism and xenophobia are on the rise, more so than ten years ago. This is especially relevant, he added, for students who face violence in their own communities. He hopes that the film will inspire a young generation to find their voices, to be aware, and to speak truth to power. He hopes that the film teaches students what happens when people stand up for each other against injustice. It was also edifying to hear from Spielberg as he talked about the making of the movie, how he filmed on location in Poland, the silence on the set, and the attention to detail that he insists must be accurate in order to honor the survivors of the Holocaust. One unique aspect of Facing History’s teaching guide for the film is that it includes a lesson titled Analyzing the Art of Schindler’s List that analyzes the film as a work of art. The lesson asks students to consider how Spielberg’s character depictions and artistic choices (such as lighting and philosophy on filmmaking) work to highlight Jewish resilience, humanity, and survival and foster an emotional engagement with the history of the Holocaust. Do you want to learn more about teaching with Schindler's List? Facing History is hosting a face-to-face teacher workshop on using the Teaching Schindler’s List guide as well as a screening of Schindler’s List (to which teachers can bring up to 20 students). The workshop is titled The Power and Influence of Film in Teaching the Holocaust. Both take place on Saturday, February 2, 2019 at Wildwood School in Los Angeles.